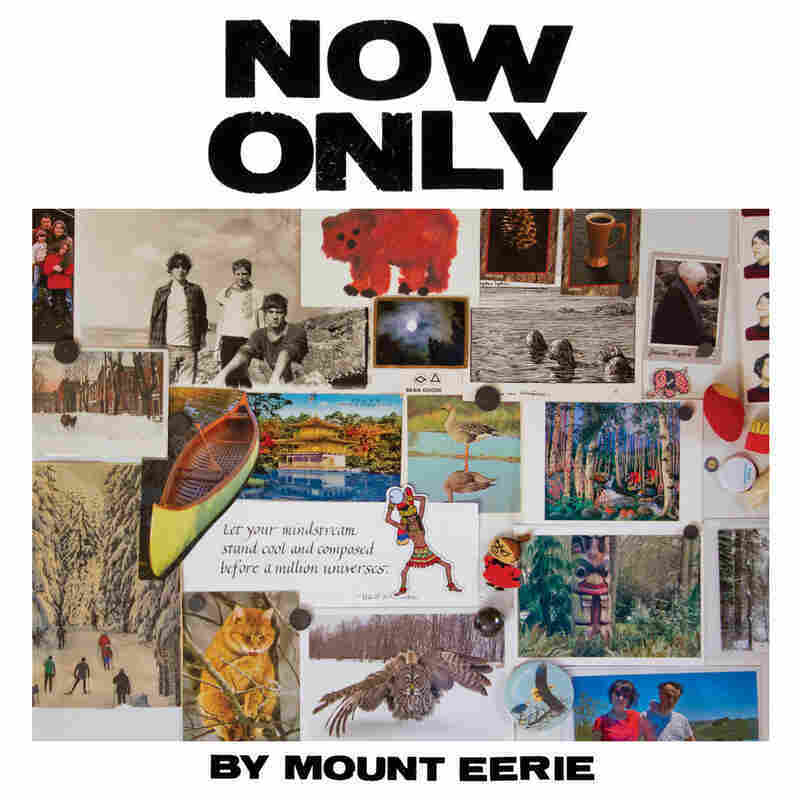 Review: Mount Eerie, 'Now Only' Where A Crow Looked At Me dealt with the shattering experience of Phil Elverum losing his wife to cancer, Now Only ponders how, when, and why one might carry on. "Sometimes people get killed before they get to finish / All the things they were going to do," Phil Elverum sings on "Two Paintings By Nikolai Astrup." The song appears on Now Only, the new album by Elverum's long-running indie-rock project Mount Eerie. It's about his wife, Geneviève Castrée, an acclaimed recording and visual artist who died in 2016 at the age of 35, one year after learning she had pancreatic cancer. Accordingly, "Two Paintings" lingers in aching, excruciating detail on Elverum's memories of Castrée and of the aftermath of her death, as a grieving husband with a motherless daughter tries desperately "to reassemble a poor substitute version of you / made of the fragments and drawings that you left behind." He does in part by evoking Astrup, the Norwegian painter of landscapes and rural life who died in 1928 at the age of 47 and whose work adorned the home of Elverum and Castrée. Now Only is a work of grief that transcends grief, that grapples with the vacuum left by loss while embracing loss as a cosmic constant. In its own way, so did Mount Eerie's previous album, A Crow Looked At Me, released last year and written immediately after Castrée's death. But where A Crow Looked At Me dealt with the shattering of an existence, Now Only confronts how, when, and why one might carry on. Crow's eleven songs were of conventional length, but Now Only comprises six sprawling tracks, ranging from just under five minutes to more than double that, performed mostly on acoustic guitar, augmented with smatterings of piano and electrics. Their breadth makes for an overwhelming listen; "Two Paintings" is nearly ten minutes long, Elverum's shadowy guitar strummed both frantically and listlessly, as if driven only by heart and muscle memories. Even longer is "Distortion," a song that, as its name suggests, features heavily distorted guitar and glacial chords that hover menacingly. As gentler acoustic sounds begin to surface, Elverum delivers a sing-song travelogue of his youthful hopes and fears in the wake of Sept. 11, 2001, all filtered through his sieve of bereavement, with frequent spirals into existential contemplation: "Though my life is a galaxy of subtleties," he sings, tender and chilling, "my complex intentions and aspirations do not matter at all / In the face of the crushing flow of actual time." Actual time plays tricks and swirls like liquid throughout Now Only. On "Tintin In Tibet," the calendar is an unreliable timekeeper that flips back and forth between his current state of emptiness and the overflowing moments when he and Castrée fell in love. His imagery is prosaic and profound: "In the morning, barely awake, I saw you standing right above me / peeling and orange and looking hungry," he recalls of their first morning together, cherishing the bittersweetness of it. As the years flicker by, they circle back on themselves, a vortex from which Elverum can't seem to escape, if he even wants to. "Earth" holds an even deeper gravity. The song leaves gaping holes in itself, littered with blank spaces and frozen notes, with Elverum unable to distinguish the present from the past. When he sings of seeing chunks of bone on the ground where he once scattered the cremated remains of his wife — "Is that exact fragment your finger that once caressed me?" — he rephrases the platitude "ashes to ashes, dust to dust" as something far more visceral and horrifically vivid. Where A Crow Looked At Me ended with the hushed, elegiac track "Crow," Now Only ends with its sequel, "Crow Pt. 2." It's more energetic than its predecessor, even while retaining the first song's darkness and dreamy symbolism. "We were skeletally intertwined once," he sings, "but now I notice ravens instead / I don't see you anywhere." Yet throughout Now Only, Elverum sees Castrée everywhere: in their front yard, on a ferry in Victoria, among big trees, gasping for breath on her deathbed, in the face of "this good daughter we made." On "Two Paintings," Elverum wonders, "Now after the ground has opened up, now after you died / I wonder what could beacon me forward into the rest of life." Now Only offers just a partial answer to that question. But it's enough.